Posted by AllisonO & filed under Life With The Os, Our House, Parenting, upstairs upgrade. Hey, wouldn’t it be absolutely nuts to push a human out of your body and then return home the next day to a house amidst a full second story remodel? O wait, that’s me. I did that. Crazy thing about second children is that you have a better idea of what’s coming. When we brought OBoy home our world came to something of a screeching halt. Suddenly we weren’t the kings of our own schedules and things stopped being predictable. We had to learn to plan less and flow more – while still getting things done when we could (because who knows when it’ll get done if not now). Sure we were “in charge” but there were thousands more variables at play than before we had a kiddo. It was a jagged little pill to swallow. So. House project. Life goes on. 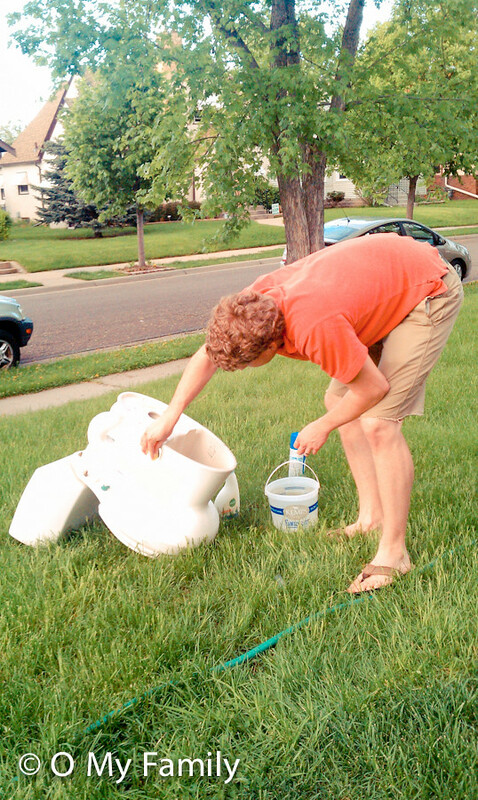 Life going on for us includes washing toilets in our front yard. Naturally. The ‘Before We Can Move Upstairs’ checklist is getting shorter (remember when we were going to be done with the renovation before OBrother’s arrival? Bahaha. Haha. Hahaha. Ha. I’ll try to get up there with a video camera sometime soon – I feel like that gives a better perspective of the space than still photos can – but really all that’s left are a few pieces of trim to be installed and lots and lots of trim to be painted. Like, all of it. 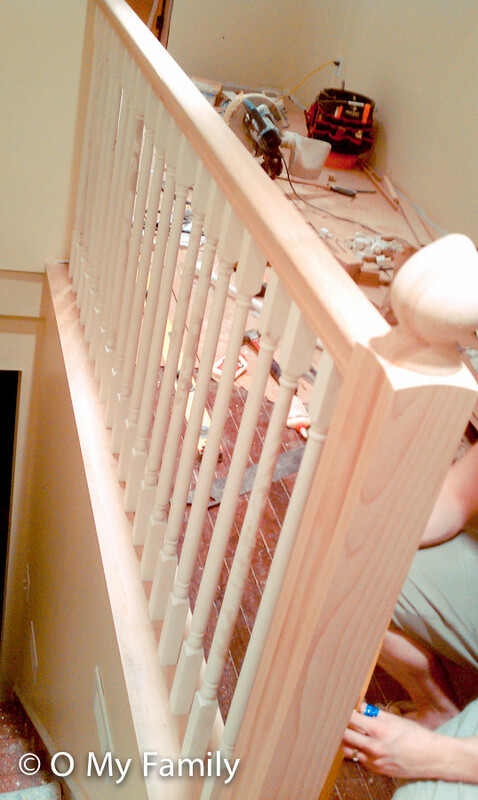 DanO (and I) installed the stair banister one night last weekend. Because that’s what normal 24 year old guys do on Friday nights… right? Thanks to Costco’s 2lb cases, we’ve also been eating an unsustainable amount of blueberries as a family. But that’s neither here nor there. Unless you were asking about OBoy’s diapers lately, in which case it would be relevant. But you weren’t. So. If we had some semblance of a functional back yard we would hang out back there. However, that project is yet to come (maybe when I’m pregnant with our third? Kidding. O SO VERY MUCH KIDDING.) so right now it’s overgrown and we play out front. OBoy’s outside favorites are chalk, bubbles, eating popsicles, watching ants, watering Mommy’s plants, sitting on the steps with one leg crossed (O My Heck will you look at my little man-boy, please? 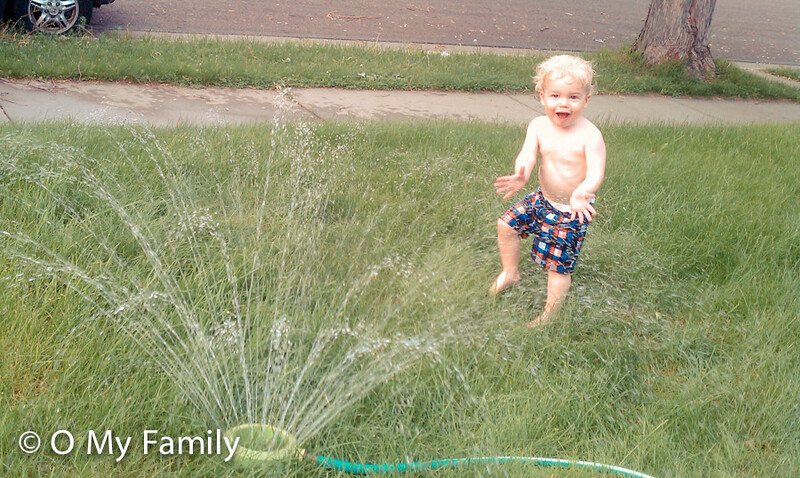 ), and running through the sprinkler. OBrother’s favorite is sleeping. Or nursing. Or being held. 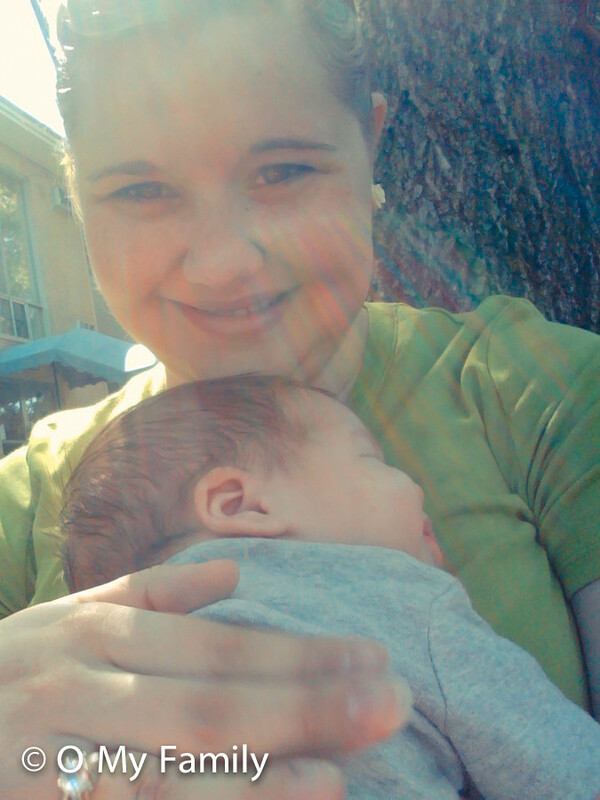 Or nursing, asleep, while being held. His is a tough life. This is me, sitting against a tree by a sidewalk. About 5 minutes before I took this, I nursed OBrother sitting against that tree. Probably one of my top 5 ‘extreme breastfeeding’ (as DanO calls it) locations. We were waiting for a parade to start during a street festival in our city. We’ve been trying to continue to be an ‘outing’ type family, despite the additional gear and effort (O, the effort!) it takes to get out of the house for the day as a family of four. But over all, being a family of four? I think it suits us. I’m glad you’re adjusting even with a huge home reno going on in the background! 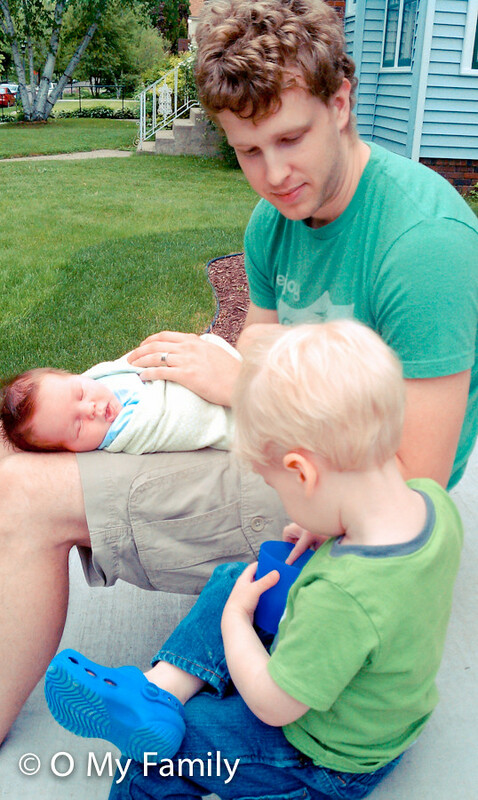 I was super surprised at how easily we adjusted to being a family of four. Things are still challenging with two under two (now two under three) but I wouldn’t change a thing. Except maybe the fact that our second baby was really really sick his whole first year. Blech. Love this! So happy for you, mama! Also, thanks for the sprinkler idea! 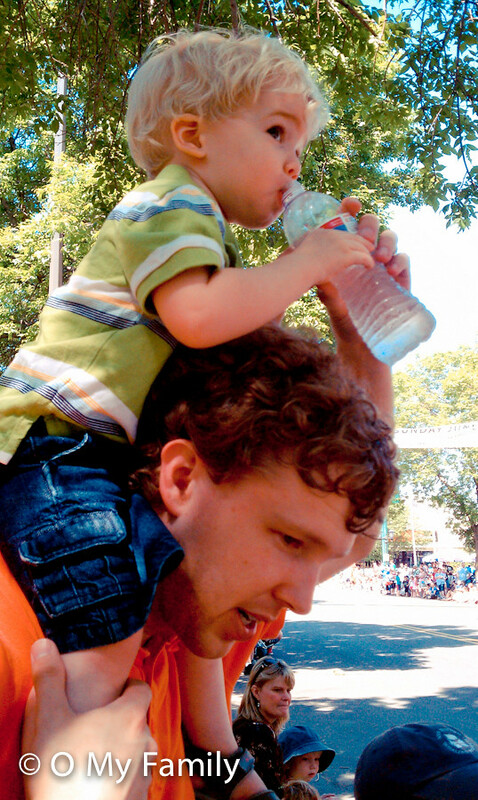 If my toddler ever decides to walk on his own anytime before another year of his life goes by, we’ll have to try that out this summer. I’ll also be 24 with 2 kids! Definitely not “normal” for most 24 year olds, but I’m happy not to be a “normal” 24 year old. :) I love to hear that life goes on with 2 kids… I’m scared for that transition! You and Dan are doing such a great job on your renovation, and I can’t wait to see how it turns out. I continue to always be so impressed by you both! Life goes on, beautifully. I often think “What do NORMAL 26 year olds do on a friday night” because I KNOW it isn’t what my husband and I do (you know, reading with our babe in our bed and watching Little Einsteins and LOVING it). Your post makes me encouraged for baby #2 which will be arriving in 5 months! Thanks for being positive in a (usually) negative mama world! Goodness, I hope I can be as awesome as you when i grow up ;) No, but really. When Joe, you know, pops that darn question and kids come along, I hope we can make the whole raising kids thing look so easy! And to answer your question. In my circle of friends there are no 24 year old men with 2 children. Or one. Ha. Maybe it’s a Seattle vs. Midwest thing? Who knows! But regardless, he rocks the ‘Dad of 2 by 24′ card! So glad things are going so well for your little family of 4. SO glad! the pictures of OBoy in the sprinkler & your 3 boys?! melt.my.heart. Seeing OBrother makes my ute all twitchy. And then seeing OBoy in the sprinkler makes me think of Joshua and how much fun he would have in a sprinkler and then I just want to do that. cannot wait to see the upstairs and how everything is turning out. That picture of OBoy dancing in the sprinkler is adorable. I hope the upstairs is moving along nicely! Sayin’ prayers that y’all meet your new deadline! If not, I’ll help when I get there. 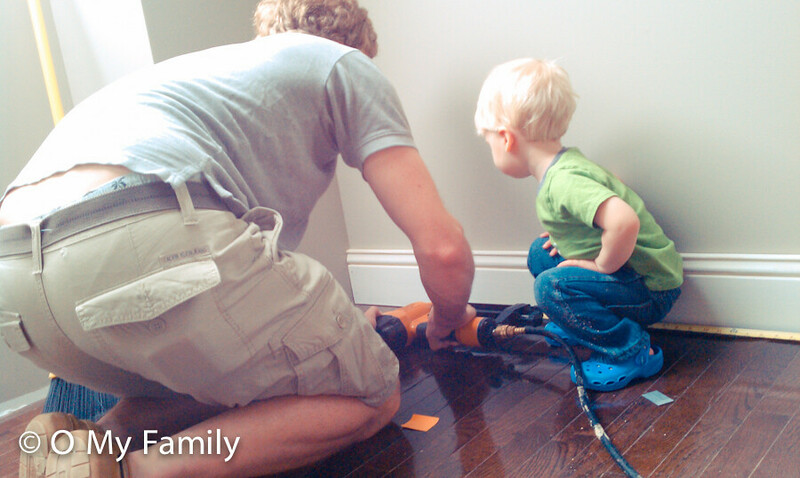 A renovation has to be tough with small children. There are so many things they can get into and you’d have to keep a constant watch on them or make sure you have child care! I feel for you! Oh, extreme breastfeeding. I’m so familiar. I’ve nursed on ancient steps outside the Church of the Holy Sepulcher in Jerusalem, huddled in a corner outside the Wailing Wall, in the backseat of a car parked at the beach in Caesarea, in the backseat of a moving car (I’m a pro at that now), in the back of a random (but really nice) guy’s van at the ministry of documents (or something) in Amman Jordan when our son was 5 days old… I could go on, but living overseas, I often find myself in extreme nursing situations.